Chinese tennis player Zhang Shuai didn't want to lose at home so she gave Haitian-Japanese Naomi Osaka a run for her money. But the stronger Osaka won 3-6, 6-4, 7-5. Osaka admits, "'It was really hard to play against her here." Naomi Osaka advances to the semi-final. It was a tough match for Naomi indeed and she fought for every point. On the third set many though it was over for the Haitian-Japanese player when Shuai was leading 4-1, then 5-3, but Naomi made a great comeback and beat her 7-5. "Selman! Pinga w al fè jig la penalize w tankou Serena Williams non ti fi! Hmmm! Ok! M pap di w anyen!" That's probably what her Haitian father said to her after the match. La Japonaise-Haitienne Naomi Osaka a remporté son match le plus difficile à ce jour, battant Zhang Shuai à l'Open de Chine 2018. 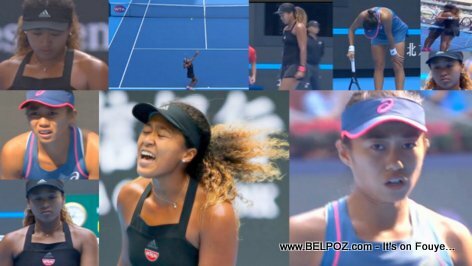 Mezanmi, Chinwaz vini pou l bat Naomi Osaka nan match Tennis la wi! Naomi telman strese li frame racket la atè.